Powrtouch Caravan Movers make awkward manoeuvring a thing of the past. All Powrtouch Movers offer a 5 year no-quibble warranty. Products are 100% British designed, assembled and tested. All models feature lightweight aluminium rollers. The Freedom for single axle caravans is available in manual only. The Evolution is available in manual and auto models for single and twin axle caravans including All Wheel Drive. 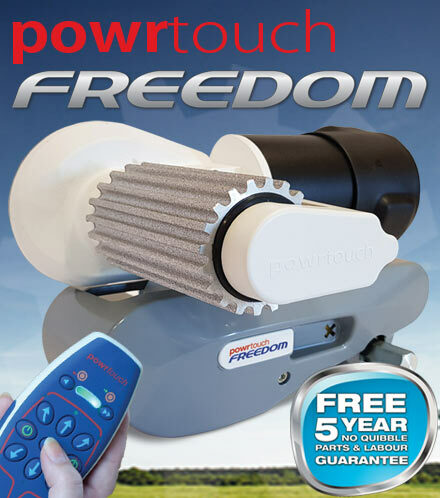 The NEW Powrtouch Freedom is the successor to the best selling Classic. The sleek lines enclose a high motor that will move a 1,500kg caravan up a 1 in 4 slope. Don't want to fit your caravan mover yourself? 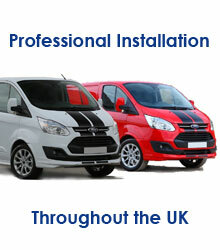 We offer a nationwide fitting service. The PowrTouch range of motor movers was developed in the UK to the high standard you would expect of an ISO 9001:2000 company registered and approved for design and manufacture. This means premier quality electrically powered caravan and trailer movers. Designed to cope with various surface conditions, PowrTouch motor movers make awkward manoeuvring on your driveway, or on site, a thing of the past. 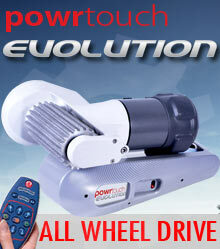 PowrWheel invest in continuous evolution of their products to ensure that they are the best available. The PowrTouch range of caravan movers offer variations in construction, wheels and power to suit a wide variety of applications, each with greater pulling power as you go up the range. PowrTouch have lead the industry with their no quibble 5 year guarantee. So how is it that they can offer such an excellent guarantee? Powrtouch products are manufactured by Powrwheel in their factory in Derbyshire. The company operates to very high quality standards having been certified to ISO 9001:2000. For Europe TÜV and CE certifications apply. This is a company with a truly international outlook and knows the value of building a reputation for unrivalled quality. 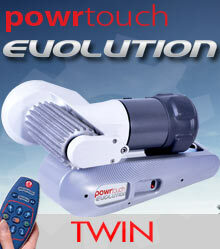 PowrTouch products are continually being upgraded to improve their performance.